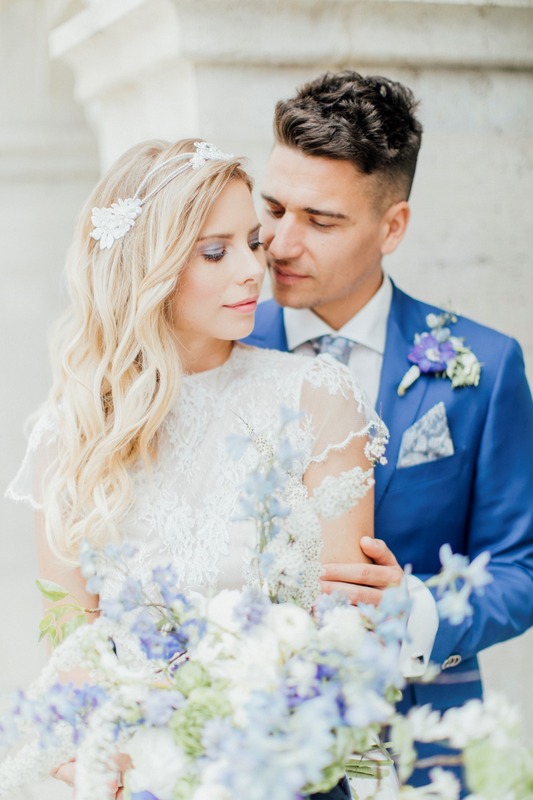 Inspired by the famous waltz, "The Blue Danube" from Johann Strauss, this styled shoot is light and airy with an elegant design concept in the romantic city of Budapest. 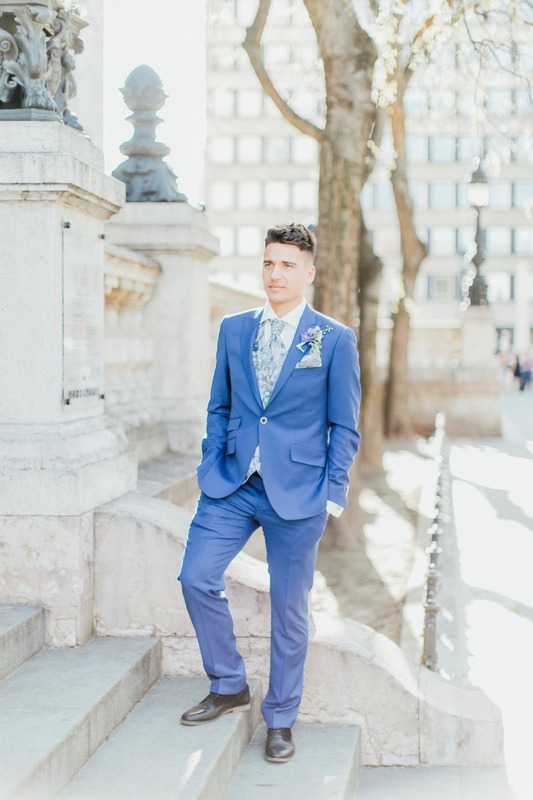 Dreamy blue tones drenched the design from Magnolias on Silk, which includes the grooms cool blue suit. The model bride looked fresh and beautiful in her Daalarna Couture wedding gown with an organza skirt and a flower head piece. So, so pretty! 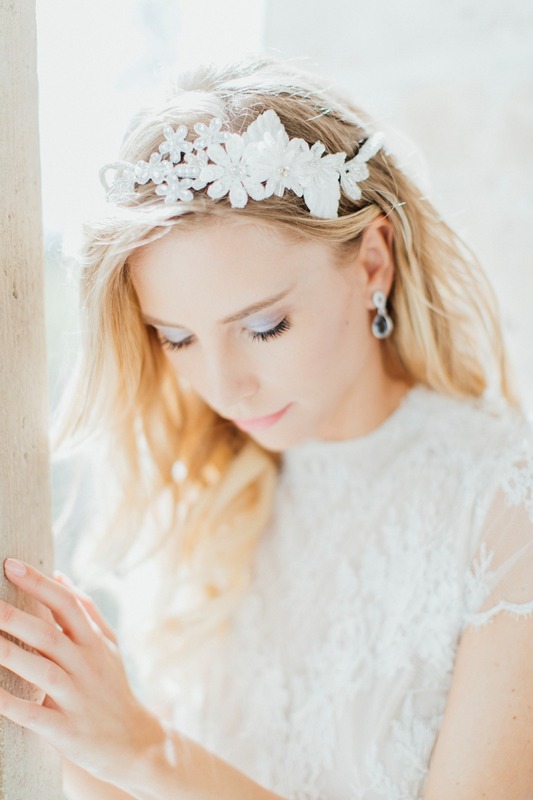 See this entire shoot below, and grab a closer look in the full gallery. 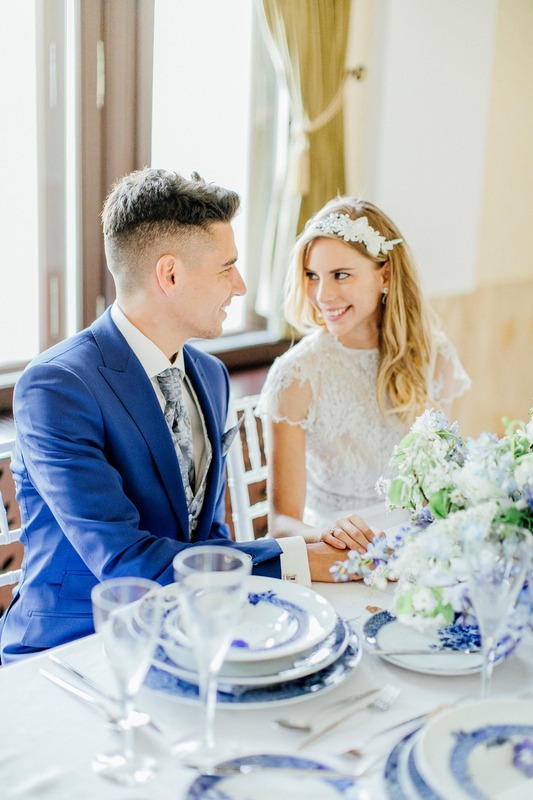 Our styled shoot with Lily and Adam in Budapest has a very light, airy and elegant design concept. The inspiration was the famous waltz "The Blue Danube" from Johann Strauss, who was a composer from Austria. The reference to Hungary is very clear, since Austria and Hungary were a dual monarchy. 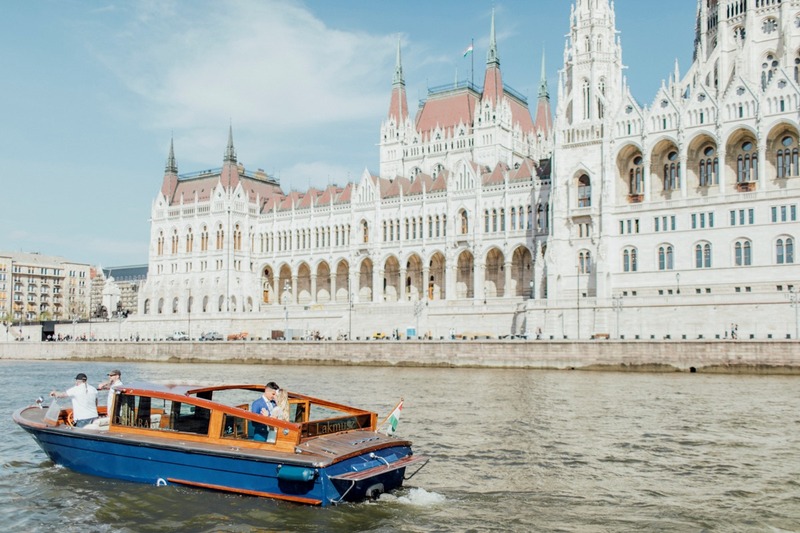 The atmosphere in Budapest is extremely elegant because of the imposing buildings of different architectural styles. 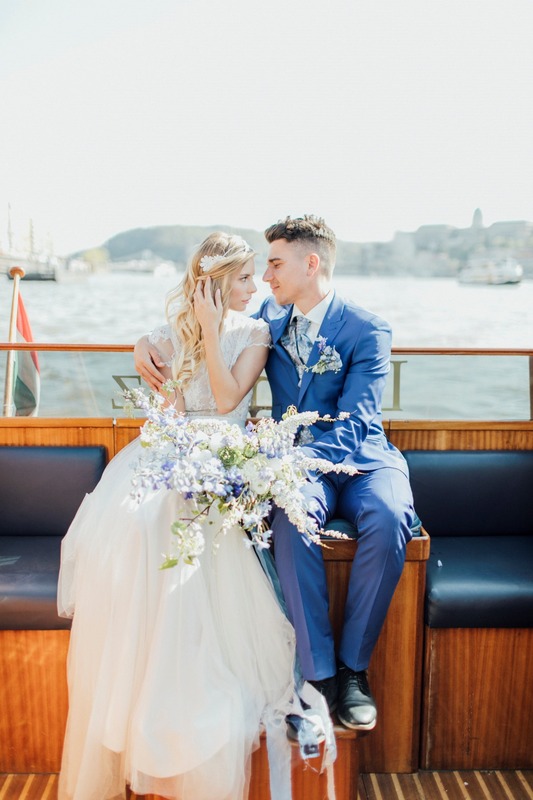 The main color of this shoot is blue, which we used in different tones because the water of the Danube comes in different tones and we wanted to capture that. 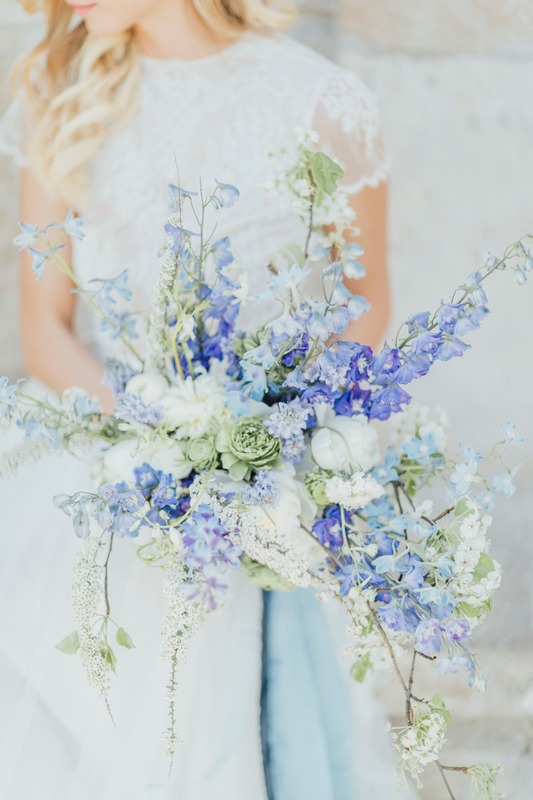 The different tones of blue can be found in the groom's suit, the floristry, the table setting including the dinnerware and in the silk ribbons of the bridal bouquet. White as the secondary color was used because of the impressive white limestone buildings, which are also very characteristic of Budapest's architecture like the famous Fishermen's Bastion and the impressive Hungarian Parliament. Small accents were set with silver. 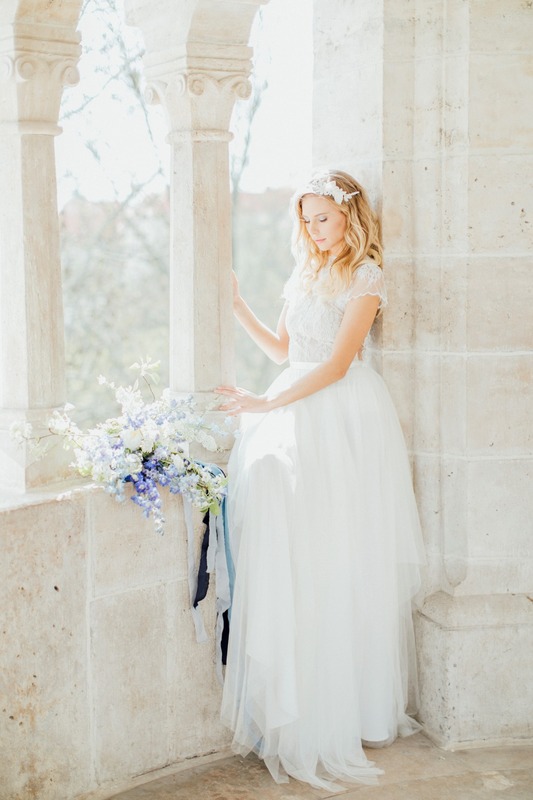 For the locations, we decided to shoot in the Fischermen's Bastion, a building made of white limestone, build on a hill and rising above the Danube. 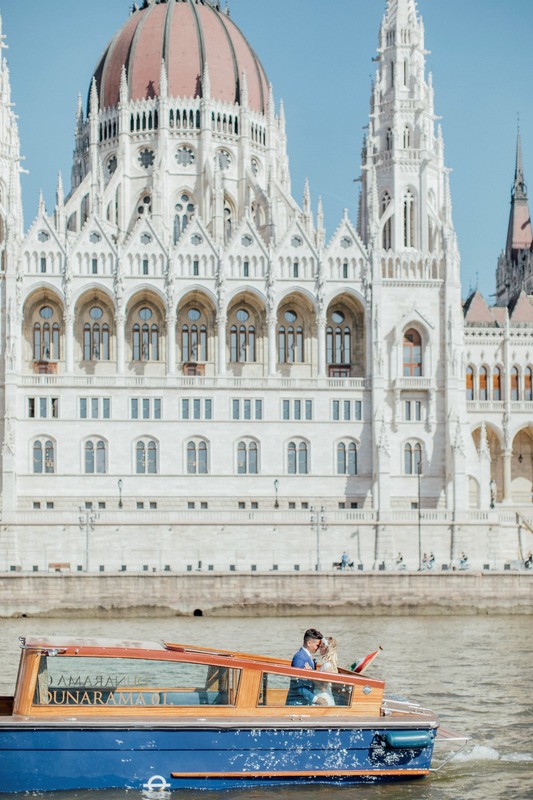 The ceremony can be held in the beautiful Matthias church nearby. The reception took place in the so-called Ice Palace. 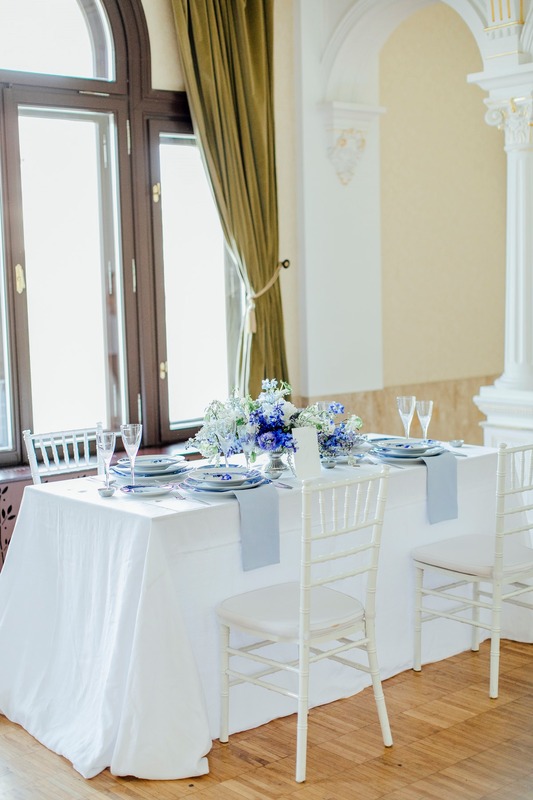 You would expect a modern building but it is a really glorious estate that looks more like a royal palace and has beautiful rooms that are just perfect for a wedding. The Ice Palace has a stunning view on a huge lake. The lake is completely frozen in the winter time and is open for people to go ice skating. From the Ice Palace, you can also see the Vajdahunyad Castle. 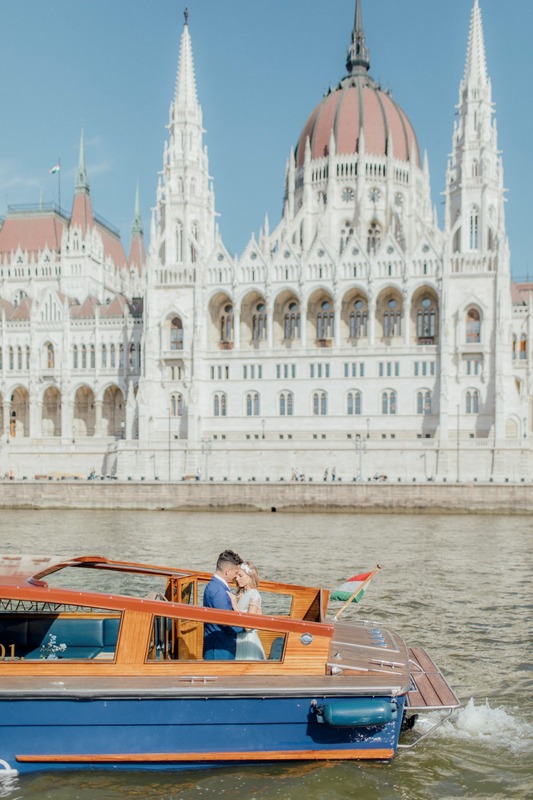 Hence the two locations each being on the other side of the Danube, we choose a water taxi as a more unique way of transportation for the wedding couple allowing amazing views on the most stunning skyline of Budapest while cruising on the river. It is not a coincidence, that the water taxi by Dunarama luxury speed boat service looks like a traditional Venetian taxi boat. It was built in a shipyard in Venice. This was perfect to pick up on the water motif we followed. 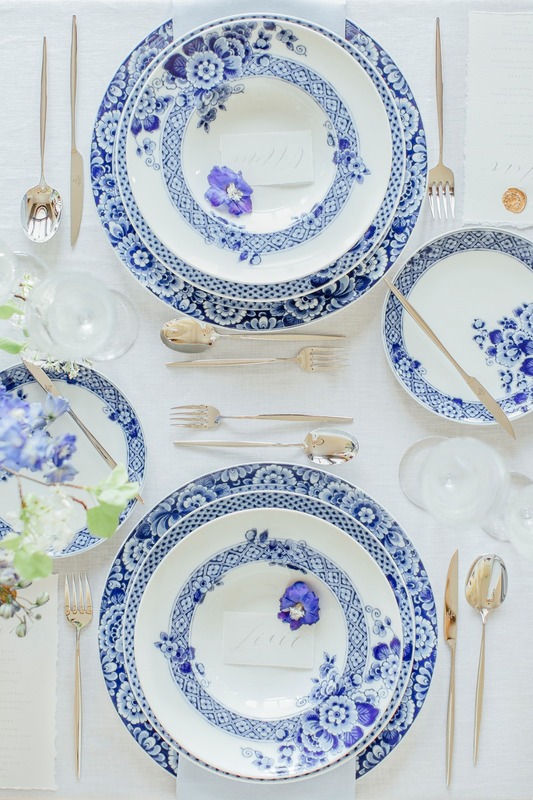 The tablescape also reflects the motif. 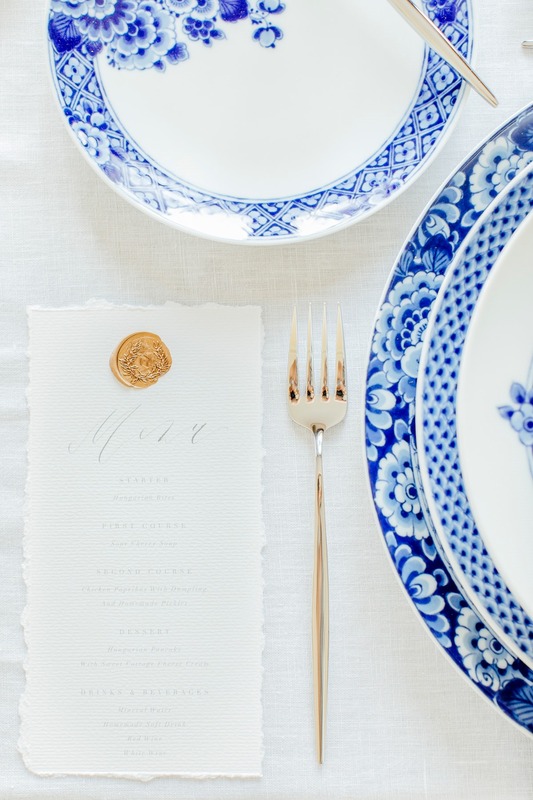 The elegant and light style continues with the white linen table cloth and the light blue linen napkins. 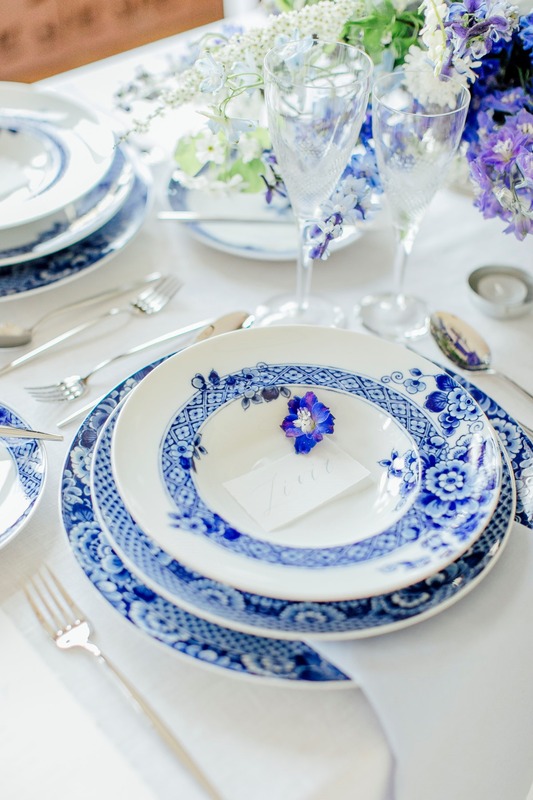 Vista Alegre's Blue Ming tableware collection really fitted into the overall theme of this styled shoot with the lovely blue pattern. We put a lot of effort into details and oversee every little detail of the decoration. To match the rim pattern of the dinner plates we chose glasses from the Vista Alegre Splendour crystalware collection. 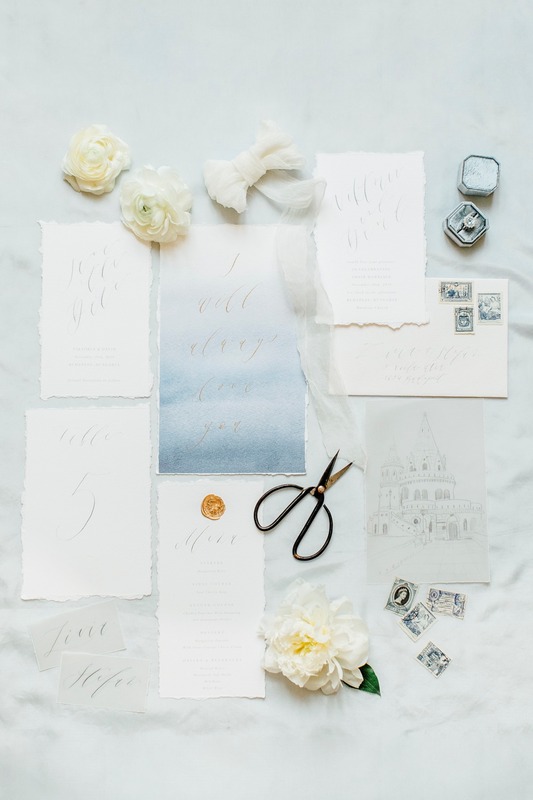 The stationery is handmade by talented German calligraphy artist Oh Julie. It contains an illustration of the Fischermen's Bastion, the soft blueish watercolor background looks like flowing water and captures the feeling of the blue Danube.